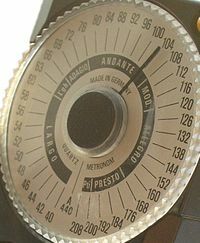 A metronome, from ancient Greek μέτρον (métron, "measure") and νέμω (némo, "I manage", "I lead"), is a device that produces an audible click or other sound at a regular interval that can be set by the user, typically in beats per minute (BPM). Musicians use the device to practice playing to a regular pulse. Metronomes typically include synchronized visual motion (e.g., swinging pendulum or blinking lights). A kind of metronome was among the inventions of Andalusian polymath Abbas ibn Firnas (810–887). In 1815, Johann Maelzel patented it as a tool for musicians, under the title "Instrument/Machine for the Improvement of all Musical Performance, called Metronome". Musicians practice with metronomes to improve their timing, especially the ability to stick to a tempo. Metronome practice helps internalize a clear sense of timing and tempo. Composers often use a metronome as a standard tempo reference—and may play or sing their work to the metronome to derive beats per minute if they want to indicate that in a composition. When interpreting emotion and other qualities in music, performers seldom play exactly on every beat. Typically, every beat of a musically expressive performance does not align exactly with each click of a metronome. This has led some musicians to criticize use of a metronome, because metronome time is different from musical time. Some go as far as to suggest that musicians should not use metronomes at all, and have leveled criticism at metronome markings as well. 8.1 Playing "in the pocket"
The word metronome first appeared in English c. 1815  and is Greek in origin: metron "measure" and nomos "regulating, law". According to Lynn Townsend White, Jr., the Andalusian inventor, Abbas Ibn Firnas (810–887), made an attempt at creating a metronome. Galileo Galilei first studied and discovered concepts involving the pendulum in the late 16th and early 17th centuries. In 1696, Etienne Loulié first successfully used an adjustable pendulum to make the first mechanical metronome—however, his design produced no sound, and did not have an escapement to keep the pendulum in motion. To get the correct pulse with this kind of visual device, the musician watches the pendulum as if watching a conductor's baton. The more familiar mechanical musical chronometer was invented by Dietrich Nikolaus Winkel in Amsterdam in 1814. Through questionable practice, Johann Maelzel, incorporating Winkel's ideas, added a scale, called it a metronome and started manufacturing the metronome under his own name in 1816: "Maelzel's Metronome." The original text of Maelzel's patent in England (1815) can be downloaded. Ludwig van Beethoven was perhaps the first notable composer to indicate specific metronome markings in his music. This was done in 1817. Musicians practice playing to metronomes to develop and maintain a sense of timing and tempo. For example, a musician fighting a tendency to speed up might play a phrase repeatedly while slightly slowing the BPM setting each time. Even pieces that do not require a strictly constant tempo (such as with rubato) sometimes provide a BPM marking to indicate the general tempo. A mechanical metronome uses an adjustable weight on the end of an inverted pendulum rod to control tempo. The weight slides up the pendulum rod to decrease tempo, or down to increase tempo. (This mechanism is also called a double-weighted pendulum, because there is a second, fixed weight on the other side of the pendulum pivot, inside the metronome case.) The pendulum swings back and forth in tempo, while a mechanism inside the metronome produces a clicking sound with each oscillation. Mechanical metronomes don't need a battery, but run from a spring-wound clockwork escapement. 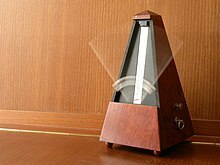 Most modern metronomes are electronic and use a quartz crystal to maintain accuracy, comparable to those used in wristwatches. The simplest electronic metronomes have a dial or buttons to control the tempo; some also produce tuning notes, usually around the range of A440 (440 hertz). Sophisticated metronomes can produce two or more distinct sounds. Tones can differ in pitch, volume, and/or timbre to demarcate downbeats from other beats, as well as compound and complex time signatures. Many electronic musical keyboards have built-in metronome functions. Software metronomes run either as stand-alone applications on computers and smart phones, or in music sequencing and audio multitrack software packages. In recording studio applications, such as film scoring, a software metronome may provide a click track to synchronize musicians. Users of iPods and other portable MP3 players can use prerecorded MP3 metronome click tracks, which can use different sounds and samples instead of just the regular metronome beep. Users of smartphones can install a wide range of metronome applications. Either method avoids the need to bring a physical metronome along to lessons or practice sessions. Perhaps the most famous, and most direct, use of the metronome as an instrument is György Ligeti's 1962 composition, Poème Symphonique for 100 metronomes. Two years earlier, Toshi Ichiyanagi wrote Music for Electric Metronomes. Maurice Ravel used three metronomes at different speeds for the opening of his opera L'heure espagnole (1911). The clicking sounds of mechanical metronomes have sometimes been used to provide a soft rhythm track without using any percussion. Paul McCartney did this on "Distractions" (Flowers in the Dirt). Following the metronome, McCartney performed a rhythm track by hitting various parts of his body. Also, in Ennio Morricone's theme "Farewell to Cheyenne" (featured on Once Upon a Time in the West), the steady clip-clop beat is provided by the deliberately distorted and slowed-down sound of a mechanical metronome. William Kentridge's "The Refusal of Time" (2012) features five metronomes in the video installation. Before a student can be persuaded to use a metronome, he or she has to know why it is important. The most obvious answer is to help keep rhythms even and clean. Another reason is to keep the meter consistent, placing beats in their proper positions in the music. Metronomes can also help a student to find and fix problems. [...] The metronome quickly alerts the player to these problems by suddenly not clicking in time with the player's beats. The quotations above show the importance of the metronome in the 20th century ("Most music teachers consider the metronome indispensable, and most professional musicians, in fact, continue to practice with a metronome throughout their careers"). Modern style [...]: light, impersonal, mechanical, literal, correct, deliberate, consistent, metronomic, and regular. Modernists look for discipline and line, while they disparage Romantic performance for its excessive rubato, its bluster, its self-indulgent posturing, and its sentimentality. Richard Taruskin calls Modernism "refuge in order and precision, hostility to subjectivity, to the vagaries of personality." It is characterized by formal clarity, emotional detachment, order, and precision. Modern style [...] It does not usually inflect or shape notes, [...] use agogic accent of placement, add gracing at all generously, or use rubato (tempos are metronomic and unyielding). Sol Babitz described it as "sewing machine" style, thinking of the rigidly mechanical rhythmic approach, the four equally stressed 16ths, and the limited flexibility in tempo that often characterizes performances of historical repertoire heard in Modern style. Modern style is the principal performing protocol presently taught in conservatories all over the world. Musicians of a hundred years ago, hearing a cross-section of present-day classical performances, would likely be struck by this primary difference between their performance practice and ours: [...] Our performance practice [...] assumes that a predictably regular beat is conscientiously maintained throughout a movement. [...] We compensate our lack of timing flexibility by a very highly developed sense of tone-color and dynamic which, however refined and polished it may be, tends to abstract and de-personalize the music-making, underscoring its "absoluteness". The principle of strict unity of beat within a movement has been part of our understanding and experience of classical music for so many decades now, that today's musicians and listeners can hardly imagine that less than a century ago the "standard" classical repertoire was performed under significantly different assumptions. The metronome has been largely unquestioned in musical pedagogy or scholarship since the twentieth century. Some writers draw parallels between a modern society that is "ordered by the clock" and what they see as metronomic performance practice of today's musicians. While this section highlights the modern trends of strict mechanical performance as something widespread in the 20th century and now, as early as 1860, some people advocated this type of "modern" performance practice.|Franz Petersilea (ca. 1860) While some in the 19th century welcomed the metronome, others were critical. A metronome only provides a fixed, rigid, relentless pulse. Therefore, metronome markings on sheet music provide a reference, but cannot accurately communicate the pulse, swing, or groove of music. The pulse is often irregular, e.g., in accelerando, rallentando, or in musical expression as in phrasing (rubato, etc.). Some argue that a metronomic performance stands in conflict with an expressive culturally-aware performance of music, so that a metronome is in this respect a very limited tool. Even such highly rhythmical musical forms as Samba, if performed in correct cultural style, cannot be captured with the beats of a metronome. A style of performance that is unfailingly regular rhythmically might be criticized as being "metronomic." Many notable composers, including Felix Mendelssohn, Richard Wagner, Giuseppe Verdi and Johannes Brahms, criticised use of the metronome. ... this series of even, perfectly quantized, 16th notes, is no more evocative of samba, than a metronome would be. In fact, this representation neglects what makes up the samba essence in the first place – the swing! A good performance is so full of these minute retardations and accelerations that hardly two measures will occupy exactly the same time. It is notorious that to play with the metronome is to play mechanically – the reason being, of course, that we are then playing by the measure, or rather by the beat, instead of by the phrase. A keen musical instinct revolts at playing even a single measure with the metronome: mathematical exactitude gives us a dead body in place of the living musical organism with its ebb and flow of rhythmical energy. It may therefore be suggested, in conclusion, that the use of the metronome, even to determine the average rate of speed, is dangerous. Numerous other quotations critical of the metronome can be found at Wikiquote: Metronome. Metronome technique is extensive and has been the subject of several books. So this short section just summarizes some of the main ideas and approaches. The "intuitive" approach to metronome practise, is to simply play along with a metronome. With metronome technique however, musicians do separate exercises to strengthen and steady their sense of rhythm and tempo, and increase their sensitivity to musical time and precision. The basic skill required is the ability to play precisely in the pocket with the metronome in a relaxed fashion. This first step helps the musician to relate to the time of the metronome clearly and precisely at the millisecond level, to help internalize a similarly precise sense of time in yourself. It is not a goal in itself, and the aim is not particularly to be able to play like a metronome. It is harder to play in the pocket with the metronome than one might expect, especially with piano or percussion. That's because the metronome click may seem to vanish when one hits the click exactly – or may be heard less distinctly. 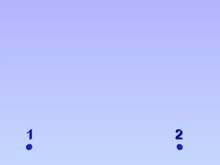 The further one is away from the click the more easily one hears the metronome. Musicians who attempt to play in the pocket with a metronome without use of the established techniques for doing this may find that it introduces tension and effort into their instrument technique. To address these issues, musicians start by learning to play consistently ahead or behind the beat whenever they want to. As a result, they develop a clear sense of "where the click is" and so can also play to hit the click as well, in a relaxed way. The other thing they do is to listen out to hear how the sound of their playing merges with the metronome to create a new sound when playing precisely in the pocket with the metronome. By listening in this way (and through other exercises) it is possible to play precisely in the pocket with the metronome in a relaxed fashion. At the same time as they work on playing in the pocket, they also work on flexibility and the ability to play in the same precise way anywhere in the beat. 2/4 at 60 bpm. Plays 5 measures then goes silent for 2, 3, 4, and 8 measures (alternating with 2 measures played). Play in the pocket with the click. Are you still in the pocket when the metronome comes back on? One of the exercises in metronome technique to help internalize a precise sense of time and tempo. Practise subdividing the beat, with the metronome set to a slow tempo, including set to click on the measure beat, every second measure, the second beat of the measure instead of the first (or the second and fourth, technique used for jazz), set to click every 5 beats for a rhythm in 4/4, and so on. And many other exercises. Much of modern metronome technique is to do with various methods to help resolve timing issues, and to encourage and develop a clear sense of musical time and to help with precision of timing. This steadiness and precision you can develop and encourage through metronome technique does no harm to musical expression in timing and rhythm; indeed one of the motivations is to help with nuances of timing and tempo. An analogy with art may help. It's like Giotto's circle, or Apelles' straight line, if you can play a perfectly steady and precise beat, it helps with nuances of timing., It doesn't mean that you can only play perfectly steady beats, just as Giotto or Apelles impressive displays of technique didn't mean that they could only draw circles and straight lines. Modern metronome technique addresses the issues of expressive musical rhythms in many ways. For instance, much of the focus of modern metronome technique is on encouraging and developing a good sense of tempo and timing in your playing, and in your mind. So you may work with the metronome in separate exercises to achieve this. When you have a more precise sense of the passage of time, you can then choose for yourself how to use this in your musical performance. You still play in a musically expressive fashion with continually changing tempo and beat; the only difference is that as a result of your work on precision of timing with use of a metronome, you are more aware of what you are doing..
To be an artist one must be able to play in perfect time – slow, fast, or anywhere between. Then one must be able to leave the time at will. This is not the same as having the time leave the player, and that is the effect if one is not able to play with the metronome. Play beats ahead or behind the click – and get comfortable with playing anywhere relative to the metronome click. At the same time you can work on developing a higher level of awareness of the many natural rhythms in your everyday life and use exercises to help bring those rhythms into your music. Time Feel, the subject of Chapter 7, is one of the great keys to musicality for rhythm section instruments. But being able to play behind or ahead of the pulse can also add expression to a melodic line. This, along with slight changes in dynamics, creates phrasing in music. The ability to hear the pulse and yet accelerate or decelerate slightly is a great way to incorporate human feeling into a musical performance. Of course, this is all relative to the tempo, and is best achieved relative to a steady tempo. In other words, the more definite your sense of pulse, the better your capability to manipulate it. This also works for the actions of ritardando and accelerando, as they are relative to a steady pulse and are best performed gradually rather than in sudden shifts"
Rhythm is everywhere. Be sensitive to it, and stay aware of spontaneous occurrences that can spur rhythmic development. Listen all the time and use your imagination. Become a rhythm antenna. An exact sense of the passage of time doesn't come to humans so naturally (sometimes time may seem to pass quickly and sometimes more slowly) and that's where the metronome can help most. That's how the teachers of metronome technique referenced here think of the tool – as a way to increase your sensitivity to musical time, and develop greater precision of timing and a clearer sense of the passage of musical time – relative to which musicians can then use expressive, natural and fluid rhythms, with as much rubato and tempo variance as they wish for. If a musician decides not to use a metronome, other methods are required to deal with timing and tempo glitches, and rushing and dragging without its help. These ideas may also be useful as a complementary approach along with metronome technique. One starting point is to notice that we rely on a sense of rhythm to perform ordinary activities such as walking, running, hammering nails or chopping vegetables. Even speech and thought has a rhythm of sorts. So one way to work on rhythms is to work on bringing these into music, becoming a "rhythm antenna" in Andrew Lewis's words. Until the nineteenth century in Europe, people used to sing as they worked, in time to the rhythms of their work. Musical rhythms were part of daily life, Cecil Sharp collected some of these songs before they were forgotten. For more about this see Work song and Sea shanties. In many parts of the world music is an important part of daily life even today. There are many accounts of people (especially tribal people) who sing frequently and spontaneously in their daily life, as they work, and as they engage in other activities. Musicians may also work on strengthening their sense of pulse using inner sources, such as breath, and subdividing breaths. Or work with the imagination, imagining a pulse. They may also work with their heart beat, and rhythms in their chest muscles in the same way. Another thing they do is to play music in their mind's ear along with the rhythms of walking or other daily life rhythms. Other techniques include hearing music in ones mind's ear first before playing it. Musicians can deal with timing and tempo glitches by learning to hear a perfect performance in their mind's ear first. In some styles of music such as early music notes inégales (according to one minority view interpretation) it can be appropriate to use a different approach that doesn't work so much with a sense of inner pulse and instead works on ideas of gestures and is more closely related to rhythms of speech and poetry. Ideas from this approach can be useful for all styles of music. Notes should be subtly unequal – having no three notes the same helps to keep the music alive and interesting and helps prevent any feeling of sameness and boredom in the music – the idea of "Entasis"
This technique is especially challenging in its application, because musicians today are so rigidly trained in metrical regularity. Yet, like the beating of the heart, the musical pulse needs to fluctuate in speed as the emotional content of the music fluctuates. Like the natural shifting accents in speech, musical accents need to shift according to the meaning being expressed. To feel perfect, music must be metrically imperfect. Notes and musical phrases can be organized in gestures – particular patterns of rhythm that come naturally – rather than strict measures. The cognitive partner of hesitation is anticipation: anticipation is created by building up assumption on assumption about what will happen. When the event which should occur fails to happen at the expected time, there exists a moment of disappointment. Disappointment, however, is soon transformed into a rush of pleasure when the anticipated event is consummated. The art is always in the timing. Notes played together can be allowed to go somewhat out of time with each other in a care-free fashion "Sans souci". This just touches on some of the ideas; for more details, see "The Craft of Musical Communication". This is a minority view on interpretation of this style of music, but well worth a mention here because of its different approach to musical time and rhythm, and its relevance to the way rhythms can be practised. The more generally accepted view is that Notes inégales were played with the same amount of swing nearly all the time, like modern Jazz. Wikisource has the text of the 1911 Encyclopædia Britannica article Metronome. ^ Andrew Robertson. "Decoding tempo and timing variations in music recordings from beat annotations" Archived 2013-10-19 at the Wayback Machine. Proceedings of the 13th International Society for Music Information Retrieval Conference (ISMIR 2012). ^ Vijay Iyar. Microtiming Studies Archived 2012-11-03 at the Wayback Machine(from thesis at Berkeley university). ^ a b Alexander Bonus. "The Metronomic Performance Practice: A History of Rhythm, Metronomes, and the Mechanization of Musicality"; PhD thesis, May 2010. ^ Jon Frederickson. "Technology and Music Performance in the Age of Mechanical Reproduction" Archived 2016-11-17 at the Wayback Machine, p. 210, section "The Metronome vs. Musical Time". ^ "Oxford English Dictionary online". Archived from the original on 2006-06-25. Retrieved 2009-01-16. ^ Lynn Townsend White, Jr. (Spring, 1961). "Eilmer of Malmesbury, an Eleventh Century Aviator: A Case Study of Technological Innovation, Its Context and Tradition", Technology and Culture 2 (2), p. 97–111 : "Ibn Firnas was a polymath: a physician, a rather bad poet, the first to make glass from stones (quartz), a student of music, and inventor of some sort of metronome." ^ "A Brief History of the Metronome". Franz Manufacturing Company, Inc. Archived from the original on 2010-03-24. Retrieved 2010-04-02. ^ Mondal, Himel; Mondal, Shaikat (2018-07-01). "Applicability of android application-based metronome in physiological tests". International Journal of Health & Allied Sciences. 7 (3). ^ "Search Results for "metronome" – Matthew Hindson". hindson.com.au. Archived from the original on 2014-04-26. ^ "Big list of Windows and Online Metronomes - Bounce Metronome". robertinventor.com. Archived from the original on 2012-07-24. ^ Flowers in the Dirt 1993 Reissue CD booklet; credited as "Metronome and body percussion". ^ 1995 Remastered and Expanded Edition CD booklet liner notes. ^ Baker, Kenneth, "In, out of sync with William Kentridge's 'Time'" Archived 2013-12-13 at the Wayback Machine, SFGate.com, November 6, 2013. Retrieved 2013-12-08. ^ a b Hoffman, Miles (1997). The NPR Classical Music Companion: Terms and Concepts from A to Z. Houghton Mifflin Harcourt. ISBN 978-0618619450. ^ Steven Mauk. "Make the Metronome Your Friend" (PDF). ithaca.edu. Archived (PDF) from the original on 2010-06-16. ^ "Metronome Techniques - Uses of the Metronome". www.franzmfg.com. Archived from the original on 2011-07-11. ^ Analyzing the earliest (pre-1930) samba recordings (e.g. Pelo Telefone from 1917), reveals strong differences with many of today's "samba" performances, many of which have a very different – sterile, modernist, metronomic ("corrupted") rhythm. ^ "Thoughts on Tempi". Essays on the Origins of Western Music. David Whitwell. Archived from the original on 2008-04-09. ; quotes from Beethoven, Berlioz, and Liszt are referenced here. ^ "Fundamentals of Piano Practice: free online piano lessons - learn, teach piano". www.pianopractice.org. Archived from the original on 2010-07-10. ^ a b c Andrew Lewis Rhythm – What it is and How to Improve Your Sense of It Archived 2012-12-06 at the Wayback Machine, book II How to Improve Your Sense of Rhythm – A practical step-by-step guide to developing and strengthening rhythm and inner pulse, page 55 "Improving Pulse and Rhythm Using Nature and Aspects of Daily Life"
^ Griffiths, Jay (15 March 2011). "Songs and freedom in West Papua". the Guardian. Archived from the original on 10 October 2017. This page was last edited on 17 April 2019, at 03:49 (UTC).